April 4th was the first operation for F/O Cram and his crew since their arrival on March 22. 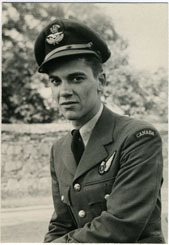 Even though Cram had completed one Tour, he did not escape completing at least one sortie as 2nd. Pilot. This was completed on March 25th. This was F/O Cram's third sortie of this second Tour. In one account of that night it describes how shortly after crossing the English coast on the out bound leg to the target, the inner starboard engine began having problems. The engine was cutting out and in while also ejecting flames. F/O Cram made the decision to continue on to the target, no mention of if the engine problem corrected itself or not. After completing the bombing run and leaving the target area he feathered the faulty engine. Descending down from their bombing height to a lower altitude for the home bound journey at 2,800 feet the outer starboard engine started on fire. Cram using both the Graviner system and feathering the engine extinguished the fire. Now with just two engines the Lancaster could not maintain any height and continued to drop. The bail out order was given at the 2,500 feet mark and the seven men managed to safely evacuate their aircraft. The final sighting of VR-V was when it was seen to crash and burst into flames on impact. F/O Crawford's account of the events leading up to the loss of Lancaster KB752 adds more details of what happened to the troublesome starboard inner engine. Commenting in an interview of what occurred after the bomb run and the decent that followed. "Then after that, we dropped down to a lower level, and that's when interesting things happened. The starboard inner engine caught on fire. Then the starboard outer engine caught on fire, from then on the pilot had trouble keeping altitude, and the order was given to bail out, and of course as bomb aimer, I'm the first one out of the front." Crawford's account adds the fact that the inner engine after feathering it again or more fully caught fire. The details for Bomb Aimer, F/O Crawford and Mid-Upper gunner Sgt. McGrath evasion is told by F/O Crawford. "I landed with quite a clatter on a tile roof with my parachute around the chimney. I met the mid-upper gunner. I called him out from behind a tree. So we proceeded to walk and hope for the best, and took our identification off our tunics. We weren't certain whether we were in enemy territory or no-man's-land, or in Allied territory. We thought we were in good shape when we saw white sheets hung out of windows, and the mid-upper gunner climbed up a flagpole and liberated a white sheet and I have half of that. We split it in half. We'd now walked perhaps about seven hours and I found a barn, and by daylight I was able to poke up a tile on the roof and saw a wonderful sight of the stars on the side of the vehicles going by the intersection, so I knew we were home free. I stopped the Corporal and told him who we were, and he called for a jeep and took us to British 2nd Army headquarters in Osnabruck."